In 1990, Lawrence Serbin was graduating college and wanted to start a business which would help make the world a better place. 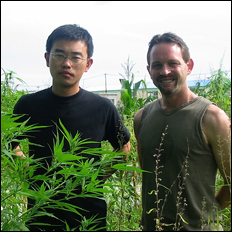 As a biology major, he had studied the properties of cannabis hemp. During these studies he discovered that hemp was not just a drug, but had been used since ancient times for its fiber to make rope and textiles. But because of current drug laws, hemp was outlawed and no longer being utilized. One morning soon after graduation, he awoke and it hit him like a ton of bricks. He would start a hemp company. At that time there were no existing hemp companies and virtually no sources of hemp products. While working a full time job, he began to volunteer his time at an organization called The Business Alliance for Commerce in Hemp (BACH). Within a year he became its national director. 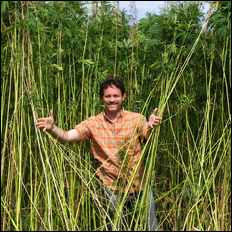 During his time as director, he familiarized himself with industrial hemp and was able to locate resources in other countries where it was still legal to grow. Lawrence decided hemp textiles offered the best opportunities for a business and stepped down as director of the organization in January 1993 to start Hemp Traders. Using a small amount of money given to him by his late grandfather, he purchased a thousand yards of hemp fabric from China. The first two years were the most difficult. Hemp Traders office was his studio apartment in Los Angeles, and he still had to work a full time job to pay the bills. Back then most people had not heard of hemp, and he kept hearing jokes about whether or not it was possible to smoke the fabric to get high. But little by little the company grew, and in 1995 he was able to quit his other job to focus all his attention to the business. The selection of hemp fabrics grew, and he expanded the business to include other hemp fiber products like twine and rope. Today Hemp Traders is the largest supplier of hemp fiber products in the country. We supply hemp fabric, hemp boards, hemp twine, hemp rope, hemp webbing and more. Our mission is to help the environment by bringing hemp back into the mainstream and supplying the best quality hemp products at the lowest possible prices. We make it as easy as possible to work with hemp by requiring no minimum order and keeping all our products in stock for immediate delivery. We work directly with the farmers, factories and manufacturers to ensure we are providing the most natural hemp products with the most minimal impact on the planet. Every day we are contacted by entrepreneurs who would like to start utilizing hemp. The Hemp Traders web site was created to provide manufacturers, companies, designers, students, and individuals with the knowledge and resources necessary to utilize hemp effectively in their projects. 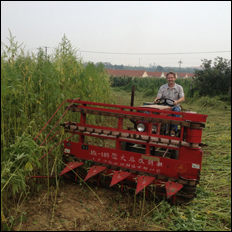 Hemp Being harvested in China!